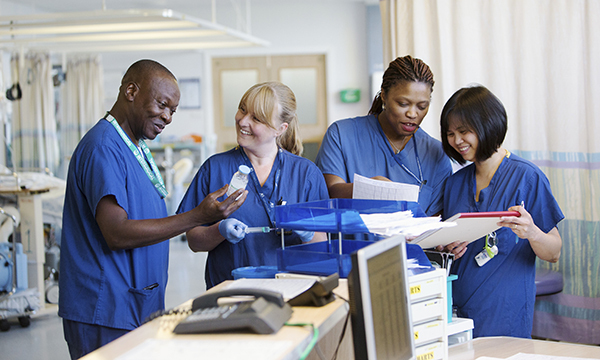 Working co-operatively as a team is a core part of the nursing role, and it involves respecting your colleagues’ needs and values even if they differ from your own. If you are part of a culturally diverse team, you may need to develop your cultural competence – the ability to treat everyone compassionately and respectfully. Take time to observe how others in your team communicate. Picture: SPL. Being understood In a clinical environment, clear communication is vital to ensure safe patient care. But people communicate in verbal and non-verbal ways and difficulties can arise if you misinterpret body language, for example. There are also vast differences in cultural norms to be aware of, such as when to make eye contact, respecting personal space and the appropriate use of touch. Tip Be inquisitive and take the time to observe how others communicate – what is behind their words? Be open and honest and encourage others to do the same. It takes courage to admit that you don’t understand something or to explain to a colleague if you find something offensive. Requests for time off It is hard to please everyone. Certain times of the year, such as Christmas or other religious holidays, can bring increased demand for days off. This can lead to individuals being criticised as inconsiderate or selfish. Tip Remember that colleagues are simply trying to respect their beliefs. If you think something is unfair, speak to your colleague or line manager, but focus on remaining calm and professional and avoid talking about someone behind their back. Organise a ward meeting where recurring issues can be discussed. Colleagues feeling left out It is natural that you will form closer relationships with some colleagues than others, but it is unacceptable for a staff member to be ostracised. Sometimes this can happen in subtle ways, such as being excluded from social events. Tip It may sound like a cliché, but try to treat everyone the way you would like to be treated. If you notice someone is being left out, try to encourage them to join in. Trust your instincts; if you think someone is being bullied, speak to your line manager in confidence. Punctuality Most wards thrive on routine and staff are expected to meet patients’ needs while managing their own time. When a member of the team appears to disregard the day-to-day structure or is constantly late, tempers can flare. Tip Try to remember that attitudes to time can vary considerably across cultures. Avoid singling out one member of staff as this can easily escalate into a heated exchange. Instead use team meetings to explore issues that affect the whole staff group. The aim of any nursing team is to deliver safe and dignified care, but patients are not immune to a negative atmosphere on the ward. It is important that staff work together and respect cultural or other differences so that the nursing team functions as a unit, enhancing patients’ well-being.